To be a geek is, in one way or another, to be over-enthused, over-informed, over-excited, over-detailed. There is an awkwardness born out of a superfluity of an extraneous kind of desire that becomes a febrile quiver in the face of an interesting problem. To be geeky is to have too much interest in something to the detriment of comportment, code spilling over into a gabble, a liveliness found in something that a more reserved protocol would keep under wraps or avoid. 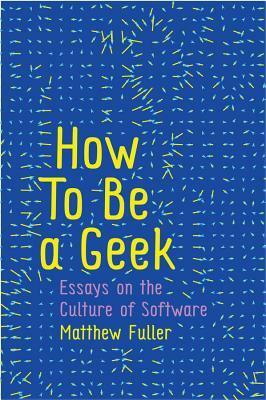 To be a geek is to be a bit too public with your enthusiasms, to be slightly unaware in turn that these thrills may, to others, rightly be dull as dust dehydrated with a special process of your own invention. Its mixture of juiciness and dryness, being able to get juiced on dryness, perhaps gets to the core of the problem. Frankly, it's a ludicrous position to be in — it is after all a bit bewildering to find this stuff so fascinating — but it is one whose perversity puts it in a strange relation of proximity to fundamental dynamics in contemporary life. Such a condition leads many geeks into precariously powerful positions. Companies founded and staffed by geeks rule the world in any ways. They fill institutions and create commercial entities. One can be both ludicrous and lucrative, a maniac for certain details that remake the cosmos by their syntax, or that found a new grammar of relation between things. Geeks created the internet and fight over its meaning. They govern and subvert governance, or keep it ticking over with regular incremental upgrades. Geeks produce extravagant contraptions that cement their positions in the most comedically venal ways, but they also make machines with panache that auto-destruct in deserts and car parks and servers; sometimes intentionally. They make games that provide the grounds of individualism for millions, and then find the wealth it occasionally brings depressing pointless but irresistible. [...] the deeply sedimented habit of using class libraries is clearly something that has resulted from the technical affordances of encapsulation. A far more finely grained division of the work of software development is made possible when the system or application to be built can be divided into discrete 'chunks'. Each class or class library (from which objects are derived) may be produced by a different programmer or group of programmers, with the details of the operations of the classes safely ignored by other teams working on the project. The contemporary trend towards the globalization of software development, with its delocalizing metrics for productivity, would not have acquired its present levels of intensity without the chunking of work that encapsulation facilitates. [...] a scan of the literature shows that it is entirely possible to have a social or literary theorist discourse on 'algorithms' without any references other than to others of their ilk. This kind of elective solipsism of disciplines is familiar to those navigating interdisciplinary terrains, and is also articulated through the kinds of citation politics that other fields, such as feminist research, have become all too familiar with. We are in the amusing position where the emphasis on materiality in recent theory results in what is technical and important sounding being elevated to the same kind of generalizations that, say, the more banal pronouncements of postmodernity suffered from in their heyday. Social theory too often beings along its upstairs/downstairs split between high theory and empiricism. [...] Github works via the encouragement of contribution. Some of this encouragement is achieved through an efficient and useful system, via the extension adoption of user experience design, contemporary 'flat design'-style graphic design and, of course, a cartoon mascot. Equally, the site operates by numerous types of granularity of access to analytics. There are numerous 'social' features such as letting you view the repos 'people you may know' have starred [...] we have the archive also operating as a matrix of capture and semiotization devices driven by the imperatives to rate, share, participate! As an economic factor, such hyper-auditing devices allow the site to become a means of finding an hiring programmers; Git and Github profiles become key to coders' CVs as a means of displaying the productivity, uptake and significance of the work produced. In this way, as in others, the archive is a site of production, an engine for the development of new software that involutes the sense or the archive as a repository of the unchanging past. Storage becomes the site of production when the form of production is variation. [...] Post-FLOSS inhabits conditions in which code objects, scripts, css files for the layout of a website, configuration files for customising the look and function of a program etc. form so much part of everyday generic stuff that they are not worth protecting in the way that the adoption of a licence implies, even when that licence is available on a drop-down menu.